Brad Lyons says Coleraine head back home from Serbia with mixed emotions after securing a 1-1 draw with Spartak Subotica in the Europa League. Darren McCauley’s 23rd minute goal, the Bannsiders first in European competition since Rory Hamill netted against Uniao de Leiria in 2003, looked to have secured a fantastic win in Novi Sad. But five minutes in to stoppage time the hosts were awarded a soft penalty, which Mile Savkovic converted. 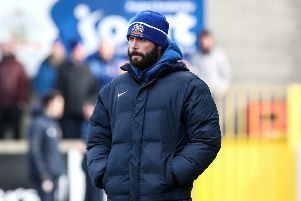 Lyons though believes Coleraine have achieved their first objective of keeping the tie alive for the second leg at The Showgrounds next Thursday. “It’s mixed emotions for us really after that,” admitted the midfielder. “The way the game has finished up we’re disappointed, but before the game out team talk was to get something out of the match to bring home next week. “We are happy in a way, and when we debrief and break it all down we will be delighted. “It’s a 1-1 draw so it’s all to play for back in Coleraine. “Conceding a late penalty is a tough one to take but we’ll go again. “We obviously know a bit more about them now. “We had watched some videos of them before the match, but now we know how to play against them. “We’ll not be scared of anything, especially with the atmosphere back at The Showgrounds. Coleraine coach Trevor McKendry heaped praise on the players after the game. “To get a draw away from home in Europe is probably more than I thought we could achieve, but when we got the early goal we had something to hold on to,” he said.